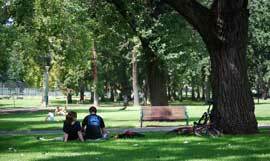 If you're visiting Melbourne Museum, don't forget to leave time to walk round the lovely Carlton Gardens where the museum's located. 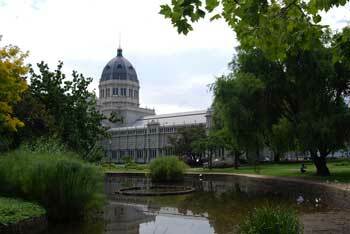 ........These 35 items include some of the old buildings surrounding the gardens. .........And you've probably still got tons of free places to check out before you need to go spending any money if you've been busy reading this website! .........The other two fountains are the Hochgurtel fountain and the French fountain. The Hochgurtel fountain is particularly impressive and you can see in the photo above that it's a common wedding location shoot. There are a couple of lakes, fig trees where aborigines used to meet, the Curators Cottage which was built in 1891, trees and flowerbeds as laid out in the 1880's and various other points of interest. 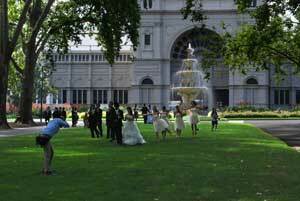 The Royal Exhibition Building and Carlton Gardens are actually on the World Heritage List. It's a pleasant litle stroll and shouldn't take you more than an hour. The route is flat so it's suitable for prams and wheelchairs.